Sewer Backups are never expected and can occur anytime. The smell is horrible and it’s extremely unhealthy for you and your property. Sewer Backups is caused by heavy rainfall or flood. The excess water causes sewage backup to flow back out the city sewer lines, which causes a terrible odor in your house because it enters through your drain pipes. Heavy rainfall can cause the municipal sewer system to back up through the sewer lines and up through the drains in your basement. This is know as a Sewer Backup and can result into a Flooded Basement if you don’t have Sewer Backup Protection in your property. It is important to take appropriate action in reducing the risk of a Flooded Basement because it has the potential to send contaminated water through your floor drains, up through tubs, toilets or showers. Other causes of Sewer Backups include excess water that come up from your sink, toilet, or bathtub, tree roots, and improper disposal of grease. Sewer Backups is also caused by everyday waste build-ups, which includes hair, food, and other small waste items that are flushed and pushed down your drains. You can protect your home from Sewer Backup by installing a backwater valve on the main sanitary drain. However, please note that installation of a backwater valve may require a Sump Pump Installation as well. 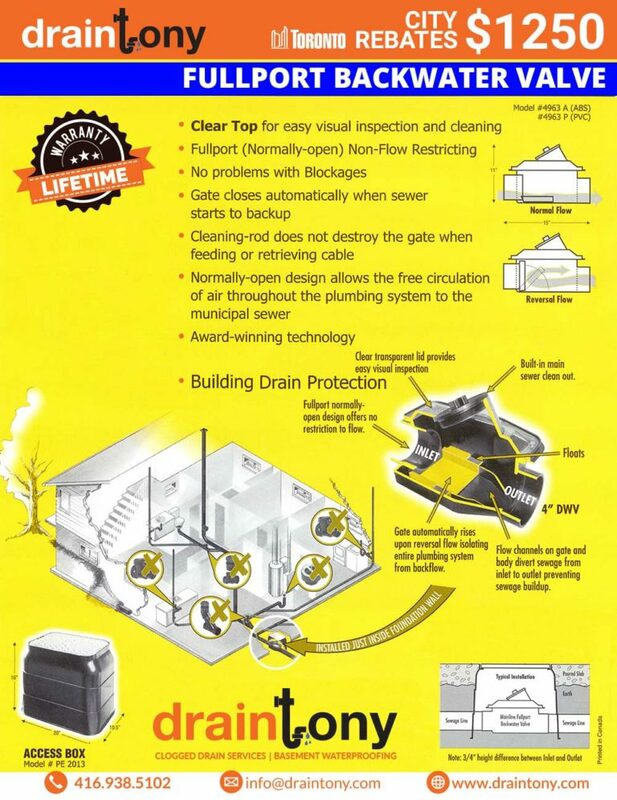 Sewer Backup is one of the Emergency Plumbing services Draintony provides. Call us now at 416-938-5102 or Contact us today to Get a Free Quote! If there is a basement in your home or if the ground floor is less than a foot above street level, the risk of a Sewer Backup increases. You can protect your property from Sewer Backup by installing a backwater valve on the main sanitary drain. A backwater valve is a cost-effective device which allows a one way flow from your home to the sewer and closes up as soon as backflow is detected. Sewage will not be able to flow back into your house if there is a Sewer Backup when you have a backwater valve in place. Inside the backwater valve there is a small flap that is opened allowing water to exit your home and any sewer gases to be vented. On each side of the flap, there is a small floatation device. If water or sewage starts to flow back into your house, these floaters cause the flap to close to prevent anything from entering our home. When the water stops coming back towards the house, gravity will allow the flap to open again to allow water and sewage to resume flowing out of your house.